A bucket list of the top sights at South Station, ordered by popularity. 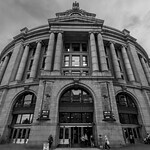 South Station — officially The Governor Michael S. Dukakis Transportation Center at South Station — is the largest railroad station and intercity bus terminal in Greater Boston and New England's second-largest transportation center (after Logan International Airport). 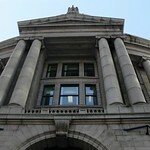 Located at the intersection of Atlantic Avenue and Summer Street in Dewey Square, Boston, Massachusetts, the historic station building was constructed in 1899 to replace the downtown terminals of several railroads. 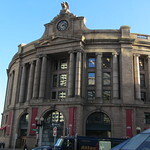 Today, it serves as a major intermodal domestic transportation hub, with service to the Greater Boston region and the Midwestern and Northeastern United States. It is used by thousands of commuter rail and intercity rail passengers daily. Connections to the rapid transit Red Line and Silver Line are made through the adjacent subway station.